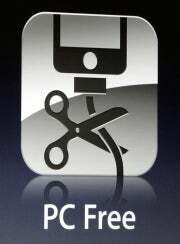 When it's released this fall, iOS 5 will be a major update to Apple's mobile operating system. But it won't be very revolutionary. Rather than introduce innovations, Apple will mostly fill in iOS's holes by borrowing features already found on other mobile operating systems, or correcting longtime annoyances. Are Apple's updates enough to maintain the company's competitiveness against Google's Android, on phone and on tablet? Yes, but just barely. A fall iOS 5 release syncs with the expectation that Apple will announce iPhone 5 in the fall (that's somewhat late; typically, Apple unveils a new iPhone at WWDC). This fall will also be one year after Apple released a major OS update for the iPad. The one seismic change to the new version of iOS announced at today's keynote: Finally, your iPhone or iPad won't have to be connected to a computer in order to get started, or get OS updates. Currently, to activate an iOS device, the first thing you need to do is hook it up via a cable to a PC. Apple was ridiculed for that fact after the introduction of the iPad 2 because Steve Jobs had emphasized that the iPad was designed for a post-PC world. Now, with iOS 5, you'll get a simple Welcome screen when you start up; and you can sync your data-including contacts, calendar, apps, and music-directly from iCloud, the Web-based data syncing service Apple also announced Monday. Apple will deliver OS updates over the air. Does that sound like it'll take forever? Apple will only send the parts of the OS that have changed, instead of reinstalling the full OS. You'll also be able to originate some actions directly from an iOS device; for example, you'll be able to create or delete calendars. Over-the-air updates is a huge change, but it wasn't first in Apple senior vice president Scott Forstall's presentation. First up was a change Forstall said was heavily requested: Updating notifications. Indeed, the inefficient and disruptive notifications system has been a long-standing sore spot with many iOS users. 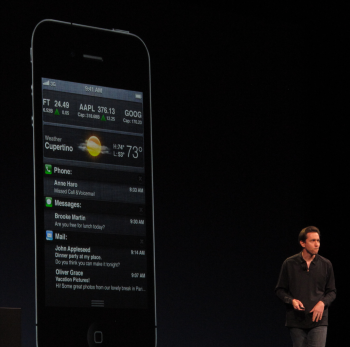 Apple Vice President Scott Forstall in front of an image of iOS 5's Notification system. Apple noted that iOS has sent out some 100 billion notifications. The catch is, whenever you see notifications on the lock screen, they disappear as soon as you unlock your phone. If you're already logged into your phone, the notification pops up on your screen, interrupting whatever you were doing at the time. With the introduction of a Notifications Center, you get a single place to view all notifications. The approach to notifications has heavy echoes of the approaches in Android 2.x and WebOS: If you're using your device, notifications will appear as a pop-up at the top of the screen, then disappear; to view all notifications, swipe your finger down from the top of the screen and you can view a list of all notifications, sorted by app and category. Also up top are updates like weather and stocks (though really, those look much like what other mobile OSes call widgets). If you tap on a notification, it takes you directly to that item within the app. However, the pop up notifications, at least as demoed today, look disturbingly like some of the ads I've seen on iOS apps. Mail will also see some major changes. You'll now be able to add rich formatting, like bold and italic text, to messages, along with being able to indent text. Mail will have a built-in dictionary and the ability to drag addresses between fields. Oh, and you can now search through the entire text of a message, whether it is on the server or on the device. For enterprise users, Apple added S/MIME support: if you have the certificate of your message's recipient, you can send your message encrypted (indicated by a lock in the address field). A nifty-looking addition: The keyboard can now be split in two horizontally, and moved higher or lower along the display. This works not just in Mail, but other applications as well and will make it easier to type with your thumbs, especially on an iPad. The mobile version of Safari will now support tabs. The new version of mobile Safari will allow tabbed browsing, a feature already found in the native browser on Google's Android 3.x Honeycomb (and available in third-party browsers running earlier versions of Android). The on-stage demos didn't reveal many details, though, such as if there were any limits on the number of open tabs. 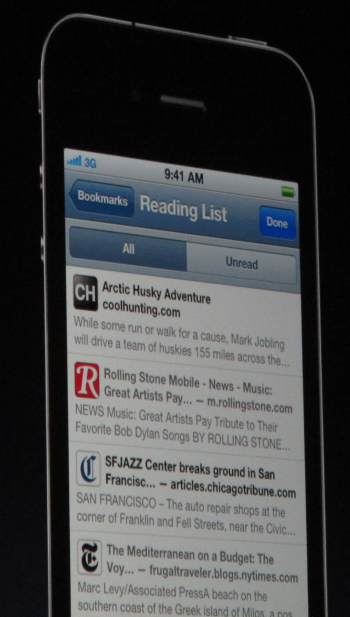 The Reading List in iOS 5 will sync articles you want to read later on all your iOS devices. Apple's will also introduce Safari Reader, which will allow you to tap a button and remove all of the ads and other Web layout distractions within a story so you can view the text as a single scrolling page. This feature appeared incredibly useful and convenient, especially if you're faced with multiple pages to scroll through. Even niftier, though, is the ability to easily e-mail the text and link from a story in the Reader. 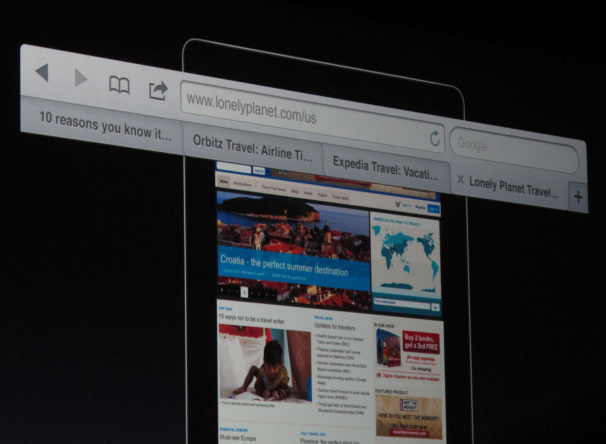 From what we saw on-stage, Apple's implementation may be conducive for e-mailing oneself Web pages for offline viewing. The Reading List, meanwhile, bookmarks a story in a list that's synced with all iOS devices, making it easy to find for later consumption. The addition of tabbed browsing and wireless syncing of contacts and calendar aren't the only features that Apple's playing catch-up on, as compared with its mobile competition. GameCenter, launched nine months ago, has 50 million users now; Apple pointedly noted that Xbox Live has 30 million users, amassed over the past eight years. Without saying so directly, Apple squarely pitted its GameCenter platform for social gaming against Microsoft's Xbox Live and Windows 8 integration. In iOS 5, GameCenter adds such features as achievement points, the ability to see friends of friends, friend discovery, game discovery through recommendations, and turn-based gaming. Meanwhile, with iMessage, iOS 5 takes on RIM's aging BlackBerry Messenger platform. The new iMessage platform works to send messages to any iOS device, regardless of whether it has SMS support. With the new platform, you'll be able to send messages to users of Wi-Fi only iPads or iPod Touches, which couldn't easily receive standard text messages. iMessage will tell you whether someone has received or read your message and give you an indication that someone is typing a note. It also provides encryption to protect your communications. While iMessage puts the squeeze on instant messaging apps, third-party Twitter developers saw iOS encroach on their turf, too. 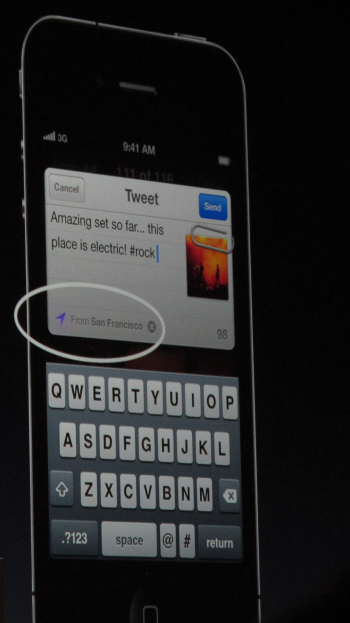 It'll be easier to tweet from within apps on iOS devices. In another sign that Twitter has become synonymous with daily mobile life, Apple has integrated Twitter directly into its operating system. With iOS 5, you won't need to re-log in every time you want to tweet, and sending tweets-including Web links, photos, YouTube videos, businesses and locations from Maps, and contacts--becomes as simple as a menu tap option, as seamlessly as if Twitter were a native app. A couple of the highlighted new features fell flat. One example: The addition of a new reminders app. While what Apple showed appeared slick enough, it was unclear to me what advantages its app will have over the scores of existing to-do list apps. One plus, though: Your reminders sync with Microsoft Outlook via Exchange, and with iCal. Another blip on the radar was the news that Apple will introduce in the App Store a Newsstand to sell magazines and newspapers. I find it curious that Apple won't bundle the Newsstand into iBooks-itself a successful venture with more than 130 million ebooks sold. Competing booksellers like Amazon meld subscribing to Rolling Stone with buying books into one experience. No matter the approach, Apple is behind in adding support for subscribing to periodicals and updating them in the background. Barnes & Noble and Amazon already offer this capability.